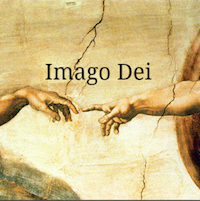 Much has been made of the important theological idea of the Imago Dei (Latin for “image of God”). See: Gen. 1:26–27, Gen. 5:1–3, Gen. 9:6. In terms of Personhood (e.g., the possession of a mind, will, and emotions that are unique to each individual enabling self-expression, etc.). And could this also be a central idea in the New Testament theology of Imago Dei with reference to Jesus in Col. 1:15 and Heb. 1:3? In both of these texts, there is imagery of ruling and reigning just after references to Jesus being God’s image in the world (e.g., “first born over all creation” in Colossians, and “sat down at the right hand of the majesty” in Hebrews). In other words, isn’t there much to be made of the functional aspect of Imago Dei? Doesn’t it seem highly reasonable — even central — just based on the way the texts related to this theme unfold, to understand “God’s image in humans” to refer to our function in this world? And doesn’t it seem reasonable in terms of our Christology to think of Imago Dei as God’s way of saying who gets to rule the world? What does this say about how we can better help each other understand how God’s image is being “re-paired” in humanity through Jesus (yes, I meant to hyphenate that)? I would absolutely love to dialogue with you more about this aspect of Imago Dei in the comments, and see if you think (as I do) that is one of the most helpful ways of explaining this amazing biblical idea that humans are made in God’s image. Oh! Great conversation starter… let me mull over this a bit… thanks, Kenny! Okay, have a chance to respond a bit more. First, I love what you are doing here, Kenny, because it is a very important part of biblical theology. It’s also very similar to the argument that Beale makes in his book The Temple and the Church’s Mission: A Biblical Theology of the Dwelling Place of God as well as the JETS article “Eden, the Temple, and the Church’s Mission in the New Creation.” The JETS article is essentially a shorter version of the book and is, in my opinion, a must read. Thus, this concept of dominion and filling or spreading is a concept that, via a biblical theological approach, is teased out throughout the OT and into the NT. You simply have to read Beale on this (another great work is by James Hamilton called God’s Indwelling Presence, which is similar). So I’m loving what you are saying here… interestingly, most of the exegetes that I’ve read concerning the Genesis verses regarding Imago Dei tend to acknowledge that there’s not a lot of concrete explanation in Scripture regarding what it actually means! Luke – I have the Beale book (actually my wife has it, uhem, and it was part of her PhD work, but I have not read it (yet!!!). I absolutely love the quote from the JETS article you cited here. Had not read that either. Some of these questions (and answers) for me have arisen out of my study of Christology, and especially “second Adam” stuff. All of these roads lead to the same place from my perspective, if we’re doing Biblical theology (as you noted). For me, the functional aspect of Imago Dei is essential to understanding what it means. I also wholly agree with Beale in the quote you supplied that the way in which the boundaries of the garden were to be expanded in Adam & Eve’s vocation was primarily through image-bearing offspring. This would have enabled them to “go into all the world and make disciples of the nations, teaching them to obey God as King.” This provokes other questions which would be interesting. Namely, might there have been some folks outside of the garden-park who didn’t know God at the same time God ‘created’ the first couple “in his image?” Using the functional view, this may be possible — though uncomfortable for a good chunk of the evangelical world to contemplate. It is something I want to think theologically about MUCH more. In the Ancient Near Eastern context the image was in some sense the god or person’s presence. Humanity was to be the presence of god on earth and Jesus (and subsequently his followers) are to be God’s presence on earth. “Co-regents” captures it quite well I think. This has big implications for green/ecology issues I think. Which is the new thing that we need to be in dialogue with I think.